Santa Collection: Jim Shore is known for his intricate santa figurines. He brings this jolly figure to life with beautiful details and vibrant colors. You can find classic Santa figurines or choose from the international collection. This collection shows Santa around the world with local clothing and scenery. From Mexico to Australia, Santa has traveled far and wide to spread Christmas joy. 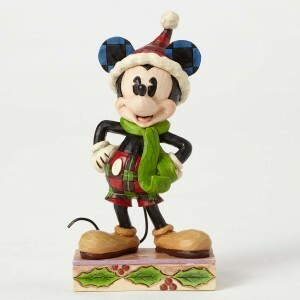 Disney Collection: The whimsy of Disney is a welcome addition to any holiday celebration! Mickey and Friends are ready to bring the fun to holiday decor. These figurines are made in the same style as the other Jim Shore collectibles, so these make a great addition to any existing Jim Shore figurine owner’s collection. Religious Collection: Finding a religious gift that really captures the spirit of the season can be difficult. Jim Shore makes it easy to find the perfect gift with their religious figurines. In addition to the traditional nativity figurines, check out the religious ornaments. These make a wonderful addition to the family tree. Which Jim Shore figurines are you most excited about this holiday season? Check out all of these and more by visiting us at CoppinsGifts.com. We’re here to help you with all of your holiday shopping needs!